We were so excited to be expecting number 4. We have a 4 year old, 3 year old, 1 year old. We went in for the ultrasound. It seemed like 5 minutes before she ever turned the screen or said a word. Finally my hubby pipes up, "So you do see ONE baby right?" Everyone had been teasing us about having twins, my hubby wanted two and I had dreamt about twins twice. In retrospect, I see that it was all God preparing me for the shock. The lab tech said "Ummm, No...there are two". My hubby had to sit and I couldn't stop laughing! I also have a 1, 3, and 4 year. 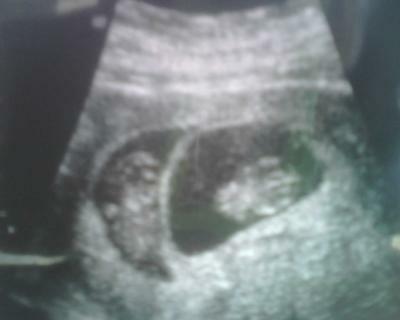 We found out April 27, 2010 that we are expecting identical twins. Big surprised since we weren't even trying. At my first ultrasound at 10 weeks, my oldest son was with me. I had just joked with my husband that morning about twins. My oldest asked the tech if it could be twins (he aparently had some vision I had not), and I turned to "B" and said, "Certainly not!" Wayne, our ultrasound tech, looked at me and said, "I wouldn't speak too soon if I were you!" I looked at him in shock. There was one baby jumping up and down (this little baby still is the active one), and then Wayne moved his finger over the screen. I screamed out, "OMG! There are two things in my uterus!" I then burst out laughing! My husband was going to have to come up with a second name after all! Oh,and did I mention! We were also expecting number "4", and going to get number 4 AND 5!